TECHNOLOGY is unlocking a window to the past at Stratford’s Guild Chapel – allowing visitors to see the building and its paintings in all their medieval glory for the first time in almost 500 years. It’s all possible thanks to a new app – which gives people a virtual reality view of how the Chapel would have looked when its walls were a riot of colour and religious imagery in the 15th and 16th centuries. Funded by the will of Hugh Clopton, wealthy local benefactor and Lord Mayor of London, the paintings were applied in the late 15th century, covering every wall within the Chapel. The imagery was bright, bold and striking – depicting the saints, the gates of heaven and the mouth of hell, and stark reflections on the afterlife, all designed to remind worshippers of their mortality and reinforce the religious beliefs being preached. When these images were banned following the English Reformation, records show John Shakespeare, father of the playwright, acted on the Royal orders to destroy them – authorising payment in 1563 for ‘defasyng ymages in ye chappell’. Centuries later, many of these paintings were found preserved under the layers of limewash applied. After recent conservation work, some can be seen today in incredible detail, such as the large ornate scene of the ‘Doom’ or ‘Judgement Day’ found over the chancel arch. But where others have been lost, or where only fragmentary remains have been found, the new app is utilising new technology of augmented reality to fill in the missing pieces. It allows visitors to stand in the Chapel and see the lost paintings reappear on screen – using the drawings of Thomas Fisher who documented them when they were discovered in 1804. It means that for the first time in centuries people can now stand in the chancel and view the ‘Legend of the Holy Cross’ which was subsequently lost forever – or point the iPad at the wooden panelling currently concealing the fragmentary remains of the ‘Dance of Death’ and see how it would have once looked. “That’s something quite incredible,” Pippa Brook, from the Guild Chapel, said. 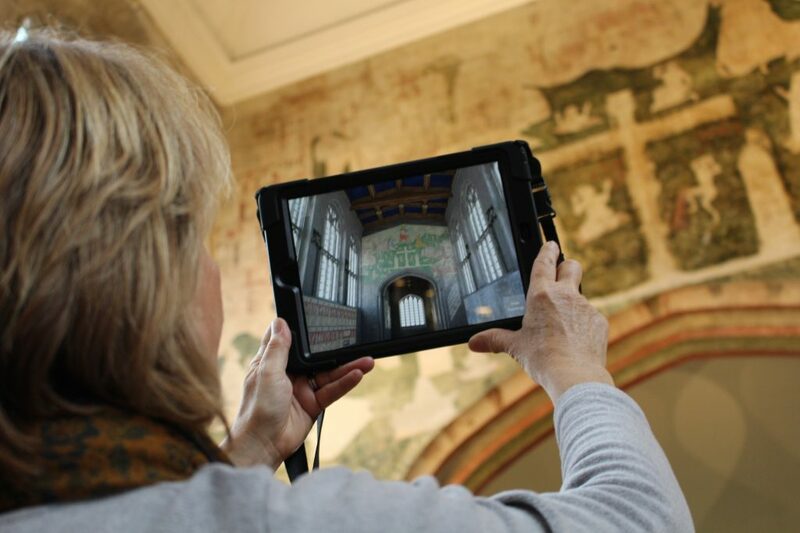 The app and accompanying iPad have been funded by the University of York, whose research on the Guild Chapel underpinned its 2016 wall painting conservation work which is now part of an extended ongoing project. “It’s been a huge privilege to work with the volunteers to create this app, which not only presents the results of current research but raises important new questions about other paintings still hidden behind the panelling in the chapel,” said Dr Kate Giles, of the University of York. 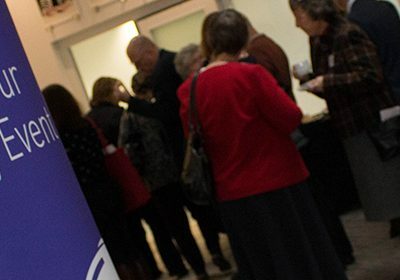 Visitors are welcome to drop-in and try the app – available when the Guild Chapel is manned by volunteer guides. See the website at www.guildchapel.org.uk for more.